Ziggy (Gallo) is a man who sends his wife Misty (Dixon) out to “meet” other men but continually maintains he’s not a pimp. Dino (Martino) is a painter, health nut and real nut who’s obsessed with the loss of his wife Rachel (MacDonald). Together the two men make money by killing people they’re assigned to kill. When Misty is kidnapped, it forces the men, especially Ziggy, to reassess their lives. Ziggy’s dream is to move away from L.A. and resettle in Alaska. Will they escape the seedy underbelly of the city? Mayhem is one of the earliest City Lights titles we’ve seen to date. It has all the names we’ve come to recognize: Pepin, Merhi, Driver, Munchkin, Gonzales and more. Most people would probably dismiss movies like this, writing them off as mere crud. But for us, there’s something intriguing about the City Lights universe. They have a particular style that is unusual. Yes, it’s not to everyone’s taste, but we’re willing to not just give them a chance, in an odd sort of way, we really like these movies. Perhaps you can see that they’re made by a group of people who were really trying to make it in the movie business. Effort goes a long way here. There are so many DTV efforts that seem like they just don’t care. City Lights movies are the antidote to that, despite their flaws. Even though Mayhem is mercifully only 78 minutes, there is a ton of filler, as characters walk around L.A. But we do get to see a movie marquee showing Top Gun, an unknown arcade game, and that gas was 72 cents a gallon back then. Ziggy and Dino sit around having “shirtless discussions” that are not at all gay (don‘t you do that with your friends/partners in crime? ), while Robert Gallo looks like a cross between Scott Baio and Joe Mantegna, and Raymond Martino looks like a cross between Richard Grieco and Curtis Armstrong. A lot of dialogue has that silly, overdubbed ADR feel to it, and if you’ve seen other City Lights movies, you know what to expect in the cinematography (videography?) department. Technical issues aside, one of the main problems with Mayhem is that the two leads are unlikable. If you cared more about them, it would have gone a long way. Plus the structure of the plot is a mess, with constant flashbacks, all topped off by the aforementioned filler. 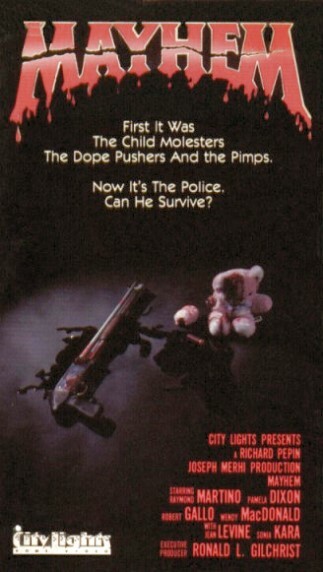 If you’re curious about City Lights titles like we are, you’ll get into Mayhem. It may take you back to the golden 80’s as you fantasize about seeing this in a video store back then. Others may want to exercise more caution. But if you see it somewhere, we say pick it up. If movies could be judged SOLELY on their posters, this would go to eleven. Completely agree. If you were in a video store wouldn't YOU want to rent this? Actually, I bought it years ago and just pulled it out of the closet VHS mausoleum for a rewatch. Cool! What a coincidence. Looking forward to your take on it. Also, is Joseph Merhi any relation to Jalal? Looked into that on IMDB and oddly there is no relation...could be wrong though. City Lights sure did release some interesting films, have you ever seen Dance Of Death, The Newlydeads, Death By Dialogue, Epitaph, Emporer Of The Bronx, Glass Jungle, L.A. Crackdown 1 and 2, Midnight Warrior, Fresh Kill or Heat Street? Dance Or Die is a classic! We have seen Fresh Kill, LA Crackdown 2 and Heat Street. Would like to see the rest of those one of these days. The Fresh Kill review is dropping on September 26th.